Test Drive 2015 Subaru Forester near Troy, Ferndale Detroit in Southfield Michigan for the ultimate combination of form and function. This vehicle is as stylish as it is practical. The design features an all-wheel drive smooth-handling machine that will get you between destinations with ease. With maximum power distribution and good traction, this vehicle handles well and gives you a quick response to a variety of road conditions. This is one of those vehicles that you have to test drive to get the full experience. Once you drive a 2015 Forester, you'll never look at ordinary cars the same way again. It has all the creature comforts that are important to you, and enjoys up to 32 MPG on the highway. The vehicle also passes the Partial Zero Emissions Standards (PZEV), so you can feel good about driving this vehicle. It scores lower on emissions than some hybrid vehicles or alternative fuel vehicles. This option comes standard on all non-turbo models, so if you opt the turbo, it still achieves good emissions but it doesn't score as low as the models with PZEV. Test Drive 2015 Subaru Forester models in Southfield Michigan, near Troy Ferndale Detroit areas, to get an idea of the model you want to go with, and work with a dealer to get you on the road in your new car today. The interior of the new Subaru Forester is extremely comfortable. Some of the many features include an adjustable 10-way power driver's seat, rear seats that recline, and never before introduced wide-opening rear doors. A panoramic moon roof comes standard on most models, and it also comes with power tilt and sliding glass opening options. During the day you can soak up some additional sun, or at night park in a quiet place and enjoy the stars with some of your favorite music playing. The seats feature a 60/40-split set of flat-folding rear seats. This gives you the option to lower the seats and gain more cargo room in your vehicle. If you're looking for a vehicle with good storage space, the 2015 Subaru Forester provides all that you need at an affordable price. Carry your passengers and all of their belongings with ease using the highly customizable cargo bay and adjustable seats. Leather-trimmed upholstery comes standard on the higher-priced models. Test drive this vehicle today, and check out how easy it is to adjust the seats to fit more cargo. The interior is loaded with technology from Bluetooth hands free communication to the premium audio setup installed. A simple X-Mode option adjusts the engines response to provide maximum grip on surfaces that are wet or slippery. Voice-activated GPS helps you get where you're going, and a test drive 2015 Subaru Forester near Ferndale MI can help you experience all these features first-hand. The 2015 Subaru Forester has raised roof rails to allow you the option to carry additional cargo on the roof. The high-intensity discharge (HID) lights provide a brighter output than traditional lights and use less energy in the process. The car features a sculpted, clean and chiseled look that improves aerodynamics on the road while increasing fuel efficiency. The 2015 Forester features good ground clearance at 8.7 inches. Fog lights, a rear spoiler and black side mirrors help to add form and function to the vehicle. The windshield wipers feature a de-icer and the heated side mirrors prevent frost from obstructing your view. Dual chrome exhaust outlets and exquisite detailing along the exterior give this vehicle a pronounced and sophisticated look. The Subaru Boxer engine comes standard on this vehicle. It features engine pistons that move from side to side to cancel out the vibration caused by the pistons. This results in a smooth, quiet ride unattainable in comparable models. This vehicle has everything you need to run smooth and efficiently on any terrain. The horizontal layout provides for better balance as well while ensuring that no power is lost in the process. The CVT transmission ensures that you get maximum performance out of a minimal amount of fuel. If you need a stable and efficient vehicle, then contact Glassman Subaru serving Ferndale, Troy and Detroit in Southfield MI for a test drive today. The wheels come standard at 17 inches. Other options are available for those who choose a higher level model, up to a wheel base of 18 inches. There is a manually adjustable tilt/telescoping steering column, and a sport-designed front fascia on the Premium and Touring models. You can open and close the rear gate without having to touch the vehicle. This comes in handy if you're shorter, or coming out of the grocery store with your hands full of groceries. Open the gate with the push of the button on your key fob, and adjust the gate's height to avoid impact with objects above. Keyless entry and keyless start is another feature that makes the Subaru a suitable option for those who want a convenient ride. Safety features are extremely important and this vehicle has a host of features to make your travels safer and more enjoyable. The Eyesight Driver Assist technology continually scans traffic for movement, optimizes your cruise control and warns you if you're about to leave your lane. If there is danger, the vehicle can even aid in slowing the car down to prevent an accident or reduce the impact. Slippery conditions are no match for the Subaru, and the all-wheel drive symmetrical wheels provide maximum control and traction. 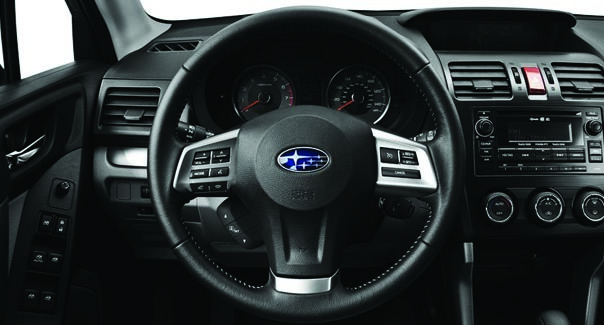 Make sure to test drive 2015 Subaru Forester to get first-hand experience of what this technology feels like. Additionally, smart braking systems and vehicle dynamics control provide a more robust and stable driving experience. Contact Glassman Subaru to Test Drive the 2015 Subaru Forester. When you want to test drive 2015 Subaru Forester models, contact Glassman Subaru serving Tory, Ferndale, Detroit Michigan from Southfield.. The experts at Glassman can get you behind the wheel of a car in no time flat, and get you on the road enjoying your life in style. With a wide inventory to choose from, you're sure to find the right vehicle that matches your budget, needs and income. The new Subaru is an excellent vehicle that is sure to keep your family safe and secure. *The above information is regarding the base model 2015 Subaru Forester. Standard specs and features may change from year to year. Contact Glassman Subaru with any questions regarding the new or used vehicle you're inquiring about.